This Conditioner that won’t make your hair heavy! Uncover your hair’s natural beauty by switching to an Australian Certified Toxic-Free®, Made Safe® and Allergy Safe Certified® alternative and leave your hair and scalp nourished and looking its best. Your scalp is the one area of your skin you’re probably not paying enough attention to. It’s important to keep your scalp free of dirt and bacteria and if you’re putting a lot of product in your hair, you do have to be more conscious of cleaning that out routinely, especially in the warmer months. Glitter Friends use the best natural and certified organic ingredients, reducing the impact on the hair cuticle. Designed to help repair dry, brittle hair, and hair that has been damaged by over-use of heat-styling appliances. There are No sulphates and No nasty chemicals, which not only strip necessary nutrients from hair, but can build up over time leaving your hair looking dull and lifeless. Plant-sourced extracts of Lavender, Tea Tree and Peppermint oils, not only smell great but, leave your hair polished, soft without added weight. This conditioner actually works and will not weigh your hair down! Perfect for those who wash their hair frequently, and who are experiencing eczema, a dry or flaky scalp will appreciate the mild formulation which is cohesive with both the scalp and strands. 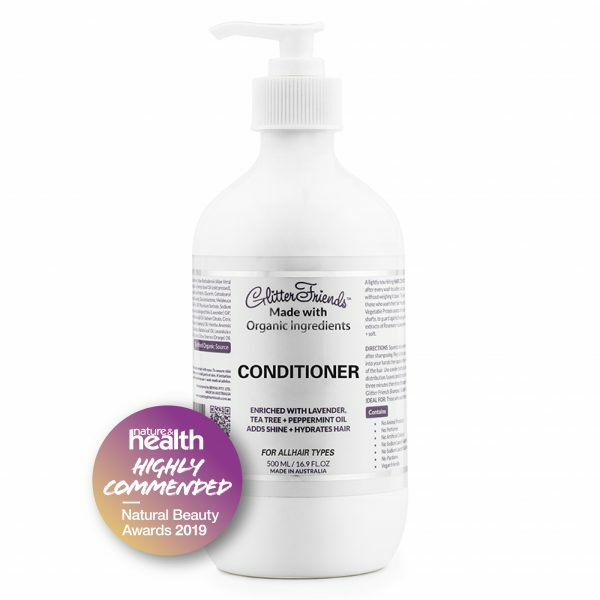 Posted By OBB Editorial Director on 04/22/2019 When my hair is dry I use a natural conditioner like Glitter Friends Conditioner as a leave in conditioner prior to washing my hair with their shampoo. I dampen my hair with water then massage a small amount of the conditioner through the ends and leave this on for at least 20 minutes before washing. This step will be used as an additional way to apply natural dye to my hair once a week. For external use only. Avoid contact with eyes. To ensure skin compatibility test product on a small patch of skin. If irritation occurs discontinue use + seek medical advice. You likely devote one to three steps of your nightly skin care routine to removing product, sweat, dirt, and other impurities from your face. Have you ever thought about how much of the same stuff builds up on your scalp every day? In the summer months especially, when your hair is exposed to chlorine, sea water, sunscreen, sweat-inducing temperatures and lots of dry shampoo! A lack of scalp maintenance can result in dandruff, an itchy scalp, infections, and a series of undesirable scalp conditions. Uncover your hair’s natural beauty by switching to an Australian Certified Toxic-Free®, Made Safe® and Allergy Safe Certified® alternative and leave your hair and scalp nourished and looking its best. You’ll noticed this Shampoo cleans out your scalp, so you left with a healthy scalp that feels beautifully clean and hair that isn’t stripped. 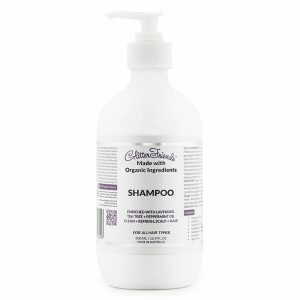 Perfect for those who wash their hair frequently, and who are experiencing eczema, a dry or flaky scalp will appreciate the mild formulation which is cohesive with both the scalp and strands. Glitter Friends natural hair products are great for children, your whole family can have squeaky clean, nourished hair! • No Animal Product • No Perfumes • No Artificial Colours • No Sodium Lauryl Sulphate • No Sodium Laureth Sulphate • No Parabens • Vegan-friendly DIRECTIONS: Three to five times weekly, prior to shampooing, brush dry hair to loosen dirt and disentangle. Dosage: One to three teaspoons, depending on hair's length and texture. Wet hair thoroughly, pour product into your hands, then gently massage onto the scalp. Rinse thoroughly and squeeze out excess water before applying Glitter Friends Hair Conditioner. A two-in-one gel infused with Rose Damascena to leave you feeling amazingly clean! This multitasking formula enriched with Aloe Vera, Chamomile and Calendula, certified organic skin softening extracts gently cleanses, conditions, and softens skin for a luxurious shower or bath experience. A gentle alternative to soaps and harsh wash gels. Antimicrobial, aromatherapeutic, antioxidant, anti-inflammatory... the list of beauty benefits is seemingly endless. IDEAL FOR: All skin types. • No Animal Products • No Perfumes • No Artificial Colours • No Sodium Lauryl Sulphate • No Sodium Laureth Sulphate • No Parabens • Vegan-friendly • Not tested on animals DIRECTIONS: Dispense a generous amount into hands or onto a sponge, lather and massage over damp skin, then rinse thoroughly, or add to your bath water. Rinse with warm water. You'll emerge feeling thoroughly cleansed, yet hydrated.